The government has closed off Maya Bay beach from 1st of June 2018. This is done to allow natural rejuvenation. The itinerary will include Maya Bay reef and entrance where you will have a first class view of the famous beach. 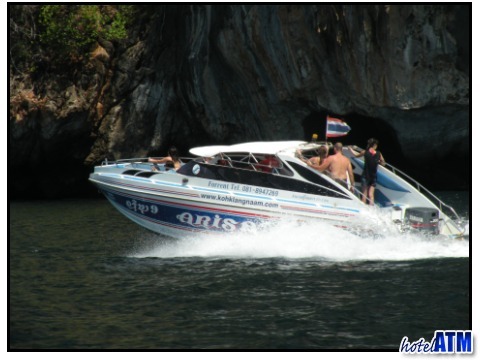 The full day speedboat tour of Koh Phi Phi Island is one of Phi Phi Island's finest. A large dash of speed is added to all the best aspects of Phi Phi, the cliffs, inlets, the sea, the reefs, beaches to create a magnificent tour. From the moment you step of the golden sands at Tonsai on to the Arisa speedboats the expectation climbs. The soaring Tonsai Towers on Phi Phi Don Cliffs dominate the bay and as you rush out towards Phi Phi Ley on the near horizon, you feel the excitement. The first stop on Phi Phi Ley takes you to Viking Cave where you can marvel at the natural gaping hole that is home to thousands of swallows, the famed birds that help make the birds nest soup. From their you pass the fjord like inlet of Pi Ley and head on down to Loh Samah where there is a chance to have snorkel and see the abundant marine life. Maya Bay is sometimes considered the jewel on Phi Phi Island and here the speedboat moors up on the sand so you can take a beach swim or wonder around behind the beach and explore this striking beach head. From their you head to Long Beach and moor off Shark Point. The Black Tip reef sharks are there when the tide is slack it gives you a chance to encounter these natural but totally harmless predators which can give you an experience and memory that will last a life time. Take care swimming in the shallow waters. After a well deserved lunch long sub sandwich, the speedboat heads off to Bamboo Island where you can relax and perhaps take a snooze under the wisteria trees or take a drink at the simple National Park Bar. Snorkeling is good here and covers a huge area of about 300 m X 300m. As the day looses it's heat the speedboat offers snorkeling at either Hin Klang or Mosquito Island depending on conditions before racing round to Monkey Beach where you can see the game families of monkeys playing on the beach. Sunset is experienced under the walls of Phi Phi Don's west coast and these magical moments are sensational.